interesting thought process, but would it work? we'll have to see the RedBull car first. if it's philosophy is too different from that of the Toro Rosso, it's never going to work. 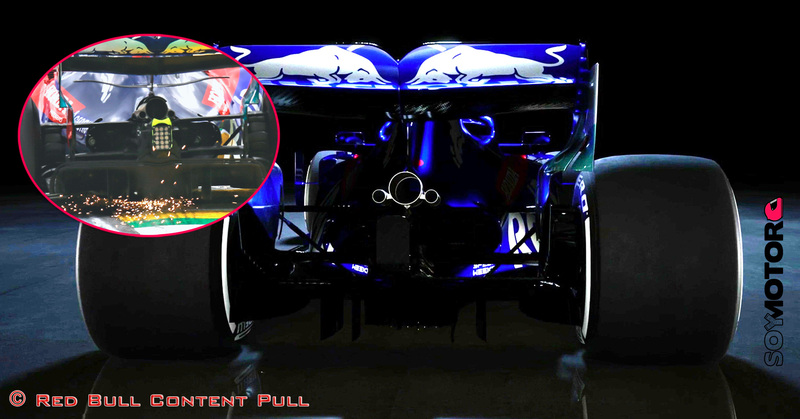 i expect the cars to be very similar, but then again, this years toro rosso looks quite a lot like last years redbull, and on a personal level, i think it's more a case of toro rosso taking over redbull's evolution, and the redbull car itself will have a different direction. i'm not talking completely overhauled (even though that can't be taken out of the realm of possibilities either), but sufficiently in another direction that 'swapping' or 'handing out' parts is not going to work. would it even be possible that for example, alfa romeo would start melbourne with it's 2018 chassis, but with 2019 wings, and race the next race with an entirely different chassis, ergo a ferrari 2019 copy, if they managed to make sure the crash test for the new tub is done the monday after melbourne? would it be unfair or unsportive? sure. but it would bring alfa easily to the top 4 or 5.especially with kimi. so yeah, what goes for them, goes for RedBull and ToroRosso. is it allowed that 2 teams have the SAME technical director? i know Adrian is focused on both, but officially, TR has none. perhaps you're on to something and that's why ToroRosso gets to have RB's 2018 leftovers. the TR guys started 'playing' with it and came up with the 2019 melbourne car and then magically have a RB15 copy by the next race. if THAT happens, then i'm REALLY curious to see Kvyat vs Verstappen and Gasly vs Ambon. interestingly, this could then apply to all over the entire field. Mercedes could get a B-team in Williams (or Racing Point). Ferrari gets Alfa (and/or Haas). Renault gets.....nothing. Mclaren, sure, but. Nah. Mclaren will never accept B-status. exactly what my thoughts were, but just as you said the "core" has to be the same for both cars and because TR has no "Newey" running around, this could be a way for them to put big pressure on the midfield contesters and especially renault and McLaren, just to show them both "see, that's what you can do with a Honda engine"
Seems that the exhaust and wastegates, are a little looking up for blowing the rear wing?? Anyone know how filming day (shakedown) went, laps covered etc. It went ominously quiet. The best shakedown ever to date. Ingenious video. The wing design also looks promising seeing Ferrari adopted similar concept must be reassuring. Feels like Redbull are using Toro rosso to test this concept. The Alfa Romeo takes it to the extreme, and that's why it surprises, but the idea is apparently known. Tost said Honda better integrated than last yr, Honda made more improvements but depends on others as well. Should not need more than 3 engines, can have for the future. Re James Key- Currently free of TR, Dont know what future will bring. Re Kvyat- Convinced that Daniel can get more success. Re Albon- Could be a surprise by the end of the yr.
Marc Priestly has heard rumors that there are vibrations in the Honda engine. Did you hear anything about it today on the circuit? Every little bit of information you have is welcome. It has already been confirmed. Dieter Rencken called Marc Priestly and the information appears to come from an ex-employee (2018) from RBR. Last edited by Wouter on Wed Feb 20, 2019 4:29 pm, edited 1 time in total. Any source on that? I rank Fritz-Dieter Rencken highly despite some of his personal views, but I need to see or hear to believe that. Last edited by FMP on Wed Feb 20, 2019 5:18 pm, edited 1 time in total.